Flowers are always a favorite gift for Mother’s Day. 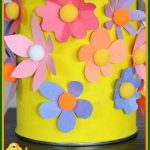 This craft recycles an Oatmeal container into a pretty planting basket that is sure to make Mom happy. I used an round Oatmeal container and since the canister is made of just cardboard, I knew my basket would be entirely natural, and could actually be planted like a peat pot. What fun! To make sure there wasn’t anything that wouldn’t decompose on it, I went ahead and peeled away the glossy label. Some of it peeled easily, but some required scraping with the blade of an open pair of scissors. Once I had all of the shiny bits of the label removed, I put the lid back on to make it more stable, and measured a line 3 inches up from the bottom, and another line 1 inch up from that one. Then I cut along both lines with the super-sharp utility knife that my father-in-law got me for Christmas last year (love it! ), creating a little basket and a 1″ ring. I used a pair of scissors to make a cut in the 1″ ring so that I could use it as my basket handle. I then went searching through my paper stash for a piece of natural, handmade paper to cover the basket. Sure, I could have painted the pieces or used glossy or fancy paper, but remember that I wanted this basket to be totally natural so that it could be planted directly into the ground. If you can’t find a natural, handmade paper in your local craft store, try looking for mulberry paper or at least use a basic scrapbook paper with no gloss or glitter. To cover the basket, I started by cutting a strip of paper and used it to cover the top edge, affixing it with non-toxic Elmer’s school glue. Then I covered the sides with a wider strip of paper. I used a few clothes pins to hold the paper in place while the glue dried, and meanwhile covered the other strip of cardboard with paper so it could be a handle. I attached the handle to the sides of the basket and clipped it all in place until it dried. What a cute little basket! Now the basket just needed a lid, and I thought a giant Gerbera daisy would fit the bill perfectly. I took some photographs of some daisies and put them into a nice Daisy Images download so I could share it with you. I went ahead and included two colors and several sizes so that we can hopefully use this download for other projects as well. I printed the images onto white card stock and cut out the largest pink daisy. The daisy needed a couple of notches so that it would fit between the basket handles, so in order to place those notches perfectly, I put the daisy face-down on the table and set the basket on top of it. Then I used a pencil to mark where the handles lined up. With my notches drawn on, I used a pair of scissors to cut them out, and then the flower fit perfectly on top of the basket. The notches keep the lid from falling off the basket, and I love how the petals stick out over the edges a little. Seriously, isn’t this so sweet? You can write a message on the back of the flower lid and it makes a great gift. The lucky recipient just needs to remove the lid, add water, and watch the flowers grow. When they get big enough to plant, the entire basket can be planted straight into the ground, since it is all made of paper and cardboard. Gardening doesn’t get much easier than that! This craft is reprinted courtesy of ChicaAndJo.com and you can see the illustrated instructions on their site. "We are Chica and Jo and we are crafty, frugal, and fun! We will help you unlock your inner crafter with new and creative projects, using inexpensive, everyday items. Visit us whenever you need ideas, crafts, or inspiration for just about anything! 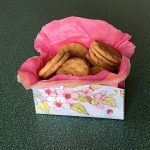 Our hundreds of free tutorials loaded with photos and video make us your ultimate online guides for all things crafty."